22" x 16" 3 850 2.25" / 3-1/8"
Guides: saw alignment, maintenance, safety 0º to 47º 20" / 12" 53.6 lbs / 17 lbs. When you’re on the job site and need to rip plywood, you want a table saw that is both portable and compact, but still fully functional for ripping your wood. 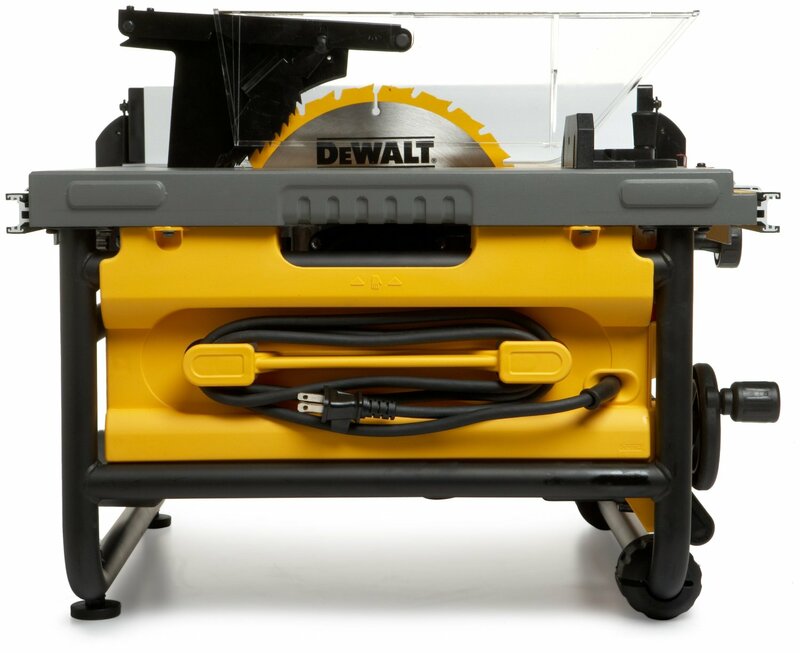 You also want a saw that won’t break your back lugging it around, and the Dewalt DW745 10-inch compact job-site table saw fits all of those needs perfectly. 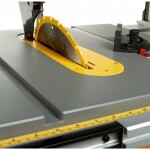 I loved working with this table saw, and I think you will, too. Read on for more information about this saw. Once you’ve unpacked your new baby, it’s on to assembly! The DW745 comes almost fully assembled, with just a few items to put on. You have to attach the miter gauge and blade guard, and install the blade. This whole procedure took me less than 10 minutes, and I was ready to cut. However, you should also take the time to properly calibrate your saw before you begin doing anything serious with it. You should spend the time using a table saw aligner and a dial indicator to accurately measure and adjust all of the moving parts on your Dewalt DW745. Mine was mostly calibrated out of the box, but the fence did have a tendency to skew a bit when I moved it to the left. One way to solve this is to go past the mark (about an inch to the left) and then roll the knob back slowly right to the mark. Your other option is to replace the flimsy metal rod connecting the two rack gears with a sturdier rod. One of the first things I did was replace the stock 24-tooth carbide blade with a high-quality diamond-tooth blade. Carbide blades are nice and all, but nothing beats a good diamond-tooth blade for sheer ripping capability. This table saw is durable like an Abrams tank. I’ve toppled it off tables time and time again, and it still keeps on working. The only bad thing about dropping it, though, is that it will mess up your careful calibration. The metal roll cage base on the Dewalt DW745 is sturdier than most portable job site table saws with their plastic bases. It’s durable, but it isn’t perfect. The surface coating scratches easily, and then starts to rub off on your wood stock. This is pretty easily cleaned up, but I wish more attention would have been paid to using a high quality coating instead of something that comes off after 20-30 rip cuts. Another problem that some consumers have found within a few months of purchase is the electrical switch going bad in the motor. This then requires a repair job, which Dewalt pays for, but can sometime take weeks to complete due to parts availability. The DW745 is incredibly easy to use. The rack and pinion fence adjusters work almost flawlessly, once you have the fence properly calibrated. The miter gauge is easy to read and use, and the 15-amp motor cuts through hardwood like a hot knife through butter. Replacing the blade is a cinch, taking just a few minutes. The most difficult part of using this table saw is aligning it, but this is the case with all table saws. 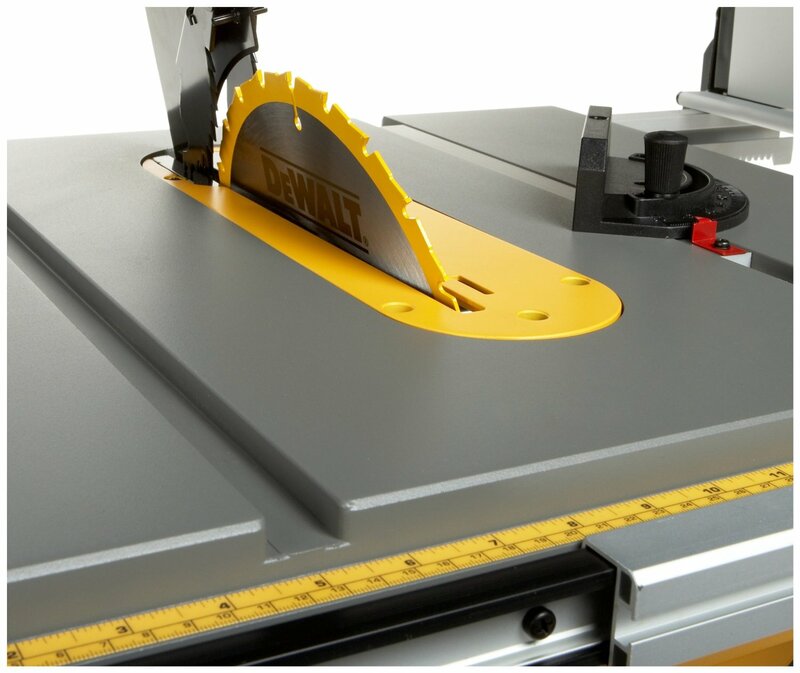 Take the time to properly align the saw’s moving parts with a table saw aligner and dial gauge, and you’ll find that it cuts true every time with very little maintenance. The DW745 comes with a three-year limited warranty, a one-year free service contract, and a 90-day money-back guarantee. Dewalt’s customer service isn’t what it used to be, unfortunately, and the service centers that perform warranty work do not always have the parts in stock to make repairs to the saw. In some cases, consumers have had to wait 3-4 weeks for simple repairs to be made, because of poor service and parts availability. 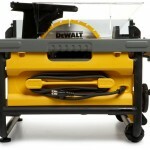 The Dewalt DW745 is a stunning table saw, when it works properly. If you are unfortunate enough to get a model with the faulty electrical switch, though, you will find yourself frustrated at how long it takes to get the saw repaired. Even with this drawback, though, the DW745 is a fine tool and will work will for jobs that require portability and a compact table saw. I just could not recommend it as your only table saw, because of the chance of it being out of commission for several weeks for repairs. Check Amazon.com’s price on this saw if you’re interested.